How much does it cost to travel to Machu Picchu? How much money will you need in Machu Picchu? S/.329 ($100) is the average daily price for traveling in Machu Picchu. The average price of food for one day is S/.79 ($24). The average price of a hotel for a couple is S/.249 ($76). Additional pricing is in the table below. These average travel prices have been collected from other travelers to help you plan your own travel budget. How expensive is Machu Picchu? How much money do I need for Machu Picchu? Machu Picchu is a site of ancient Inca ruins located about 50 miles (80 km) northwest of Cuzco, Peru, in the Cordillera de Vilcabamba of the Andes Mountains. It is perched above the Urubamba River valley in a narrow saddle between two sharp peaks, Machu Picchu ("Old Peak") and Huayna Picchu ("New Peak"), at an elevation of 7,710 feet (2,350 metres). One of the few major pre-Columbian ruins found nearly intact, Machu Picchu was designated a UNESCO World Heritage site in 1983. Thus, Machu Picchu is not only an impressive remnant of the Inca civilization, it is also one of the world's most important archaeological sites. A stop at Machu Picchu is an essential part of any traveler's itinerary in Peru, as it is one of the seven wonders of the world. The town nearest Machu Picchu, Aguas Calientes, is on the map because of its close proximity to the famous ruins. The town, now officially called Machu Picchu Pueblo, sits at the bottom of the valley and serves as the main access point to the famed sight as it is the location of the train station, bus station, and various accommodation and dining options. The city itself is not very attractive, but in all likelihood you will spend about one night here during your visit to Machu Picchu. Machu Picchu is open every day from 6:00 a.m. to 17:00 p.m., with the last entries to the site at 16:00. You will find that the most busy period is between 10:00 and 14:00. There are three different ticket options available. All include access to the Machu Picchu archaeological site, one also includes the trek up the Huayna Picchu mountain and the last one includes the trek up the Machu Picchu mountain. The Huayna Picchu, also called Wayna Picchu, is the mountain that you will see behind the famous photos of the Machu Picchu archaeological site. Its peak is at 2700m of altitude, where you will get a spectacular panoramic view on the site. As you walk up, you will pass by other archeological sites such as the moon temple and farming terraces build by the Incas. Be aware that the Huayna Picchu trek is very popular and it is advised to book your ticket in advance. The trek up the mountain is 1 hour and requires you to be in good shape to climb many stairs and walk up narrow paths. If you are afraid of heights, you may also have difficulties finishing the trek. The Machu Picchu mountain, often confused with the archaeological site, is the mountain facing the Huayna Picchu, which is higher than the later, with its peak at 3082m. It offers a different, although similarly spectacular panoramic views on the site and its surroundings. The Machu Picchu trek is less known to tourists and you will therefore find less people on your path. While it will take you between 1h and 1h30 to climb up the Machu Picchu, the path is a little bit less demanding than the Huayna Picchu, which is a better option for children and those who are afraid of heights. The access to both treks can be done during two time slots. You can choose to buy a ticket that will give you access to the Machu Picchu mountain trek between 7h and 8h or between 9h and 10h. Regarding the Huayna Picchu, the first ticket option will allow you to start your trek on the Huayna Picchu between 7h and 8h and the second option between 10h and 11h. You will also have to choose between two time-slots for the access to the archaeological site. If you are planning to climb up the Machu Picchu mountain or the Huayna Picchu, you will have to choose the ticket giving you access to the archaeological site from 6h to 12h because, as explained above, visitors are only allowed to start the trek in the mornings. If you are only planning to visit the Machu Picchu archaeological site and therefore only buying a ticket giving you access to the site, you can also choose this time slot or the 12h to 17h30 time-slot. You can buy your ticket online, or in Cusco and Aguas Calientes, but it is impossible to buy your ticket at the entrance of the Machu Picchu. 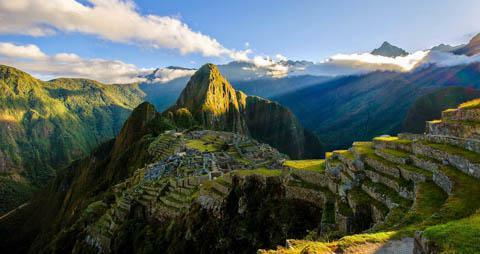 You will find many websites that offer tickets to the Machu Picchu on the Internet. Be careful of fake tickets as this is very common unfortunately. The official Machu Picchu website is machupicchu.gob.pe. The website only accepts Visa cards. You can also buy your ticket through GetYourGuide.com, which offers standard tickets as well as a variety of convenient packages including transportation and tour guides. You will not be able to get children or student discounts when you buy your ticket online. If this applies to you, it is a better idea to buy your ticket in Cusco or Aguas Calientes. Another tip: if you buy your tickets online with someone else's card, make sure to bring a copy of the card and passport of this individual so that you do not get your access refused. To buy your ticket in Cusco, with your credit card or cash, you can go to the Palacio Inka de Kusicancha, Calle Maruri 340, or the Casa Garcilaso in front of Plaza Regocijo. (Both open from 7h-19h30 Monday to Saturday.) You can also purchase your ticket for the Machu Picchu when you buy your train ticket to Aguas Caliente at Inca Rail and Peru Rail or at the Office of the tourist office association on calle Nueva Baja, 424. In Aguas Caliente, you can purchase your ticket in cash at the Centro Cultural on Avenida Pachacutec, cuadra 1, everyday from 5h20 to 20h45. An official in-person ticket to the Machu Picchu site is USD$47 and a ticket that also gives you access to the Machu Picchu or Huayna Picchu mountain during any of the two time-slots is USD$61. Online prices are generally higher. The entry to the Machu Picchu is free for children under 8 years old. Children between 8 and 17 years old as well as students with an ISIC card will be offered a 50% discount. It is rare that the 5000 tickets to the Machu Picchu site available per day are all booked, even during high season, so you do not need to worry about booking in advance. The same applies to the Machu Picchu mountain because few people know about this trek and 800 people are allowed per day. However, because the Huayna Picchu trek is very popular and there are only 400 tickets per day, booking a few months in advance is a good idea. To get to the Machu Picchu, you will first need to go to Aguas Calientes, a small touristy village, which is also called the Machu Picchu Pueblo and where you will find many restaurants, hostels and hotels usually quite expensive for what they offer. Most people reach Aguas Calientes by train, either from Cusco or from Ollantaytambo. A train ticket can cost USD$60 and higher depending on your journey, the time, the seat option and the season. You can buy your train ticket with one of the following companies, Inca Rail and Peru Rail, directly in their offices in Cusco or online. Make sure you arrive at the train station 30 minutes prior to departure with your printed ticket and your passport. From Aguas Calientes you have two options to get "up the hill" to the ruins. The first option is to walk to the Machu Picchu, perfect for backpackers who want to save money. If you are planning on climbing the Machu Picchu mountain or the Huayna Picchu after, be aware that this is a 1h trek mainly up some stairs that will require a lot of energy! Or you can take a 20 minute bus from which you will get a beautiful view on the Vilcanota river and the immense valley. This option isn't free but might be better for those who want to save up their strength. The first bus leaves at 5h30 but try to be there 15 minutes in advance if you want to be first in the queue. There are buses leaving every 10 minutes. The last bus that goes up to the Machu Picchu is at 15h30 and the last bus going back to Agua Calientes is at 17h30. If you have a tight budget, a good compromise is to take the bus to go up to the Machu Picchu and walk back down. A one way ticket costs USD$12 for adults, USD$7 for children and is free for under 5 years olds. You can buy your bus ticket on the spot or at a ticket office in Cusco (Wanchaq at Avenida Infancia 433 or Interbank at Avenida el Sol 380) and Aguas Calientes (Avenida Hermanos Ayar) to avoid waiting in long queues on the actual day. Another way to get to the Machu Picchu, usually loved by backpackers, is to trek there or combine local buses and walking. You can take a 5h local bus (colectivo) from Cusco's bus terminal, Santiago, to Santa Maria for USD$4.50. From Santa Maria, take another 2h colectivo from its bus terminal also called Santiago to Santa Teresa for USD$1.85. You can also take a shared taxi for USD$3. You will then need to take a taxi for a 20 minutes ride from Santa Teresa to Hydroelectrica for USD$1.85. From Hydroelectrica to Aguas Calientes, you can either take the train for USD$15 or walk 2h to 2h30 to the touristic town by following the railroad. The walk is rather easy and worth the effort as it is very beautiful. If you choose this option, the journey from Cusco to Aguas Calientes will take you about 8 to 10h so if you haven't left early in the morning and you see the night getting closer, don't hesitate to spend a night in Santa Teresa and continue your journey the next day. There are also buses or private vans that go directly from Cusco to Hydroelectrica or to Ollantaytambo, where you can easily get a transport to Hydroelectrica or even take the train. The Inca Trail is the most famous trek in Peru and therefore the most touristic and expensive. There are only 500 people allowed each day so make sure to book it well in advance. You can do the Inca Trail in 4 days and 3 nights (camping) or in a shorter version, 2 days and 1 night at a hotel in Aguas Calientes. This is the only trek that arrives directly on the Machu Picchu in the morning, without going down to Aguas Calientes and it passes by the Inti Punku site. The Inca Trail is closed during all of February. The Salkantay Trek is a great alternative to the Inca Trail. It was elected by the National Geographic as one of the best treks in the world! It usually lasts 5 days and 4 nights with a walk through the Vilcanota cordillera, a few archaeological sites, waterfalls and numerous species of orchids. You will witness the incredible biodiversity of our planet, from high altitude mountains to humid forests. One trek, two worlds. The Trek de Lares is less known and therefore less frequented. This trek is based on meeting the local communities and does not include any visit to archaeological sites. The scenery is beautiful and the trek is shorter than those in the Inca Trail or Salkantay Trek. You will have a transport take you from Ollantaytambo to Aguas Calientes, where you will spend a night. It is an interesting compromise for those who do not wish to do too much trekking. The Trek de Huchuy Qosqo will take you, as its name suggests, to the Huchuy Qosqo, the most important Inca site in the Sacred Valley after Ollantaytambo and Pisac. It can only be reached by foot or horse (there is no road), which has greatly contributed to its preservation. The Trek de Huchuy Qosqo is considered to be the easiest trek to the Machu Picchu, with only 1 day of trekking (12km) while visiting Huchuy Qosqo, before spending a night in Aguas Calientes to then visit the Machu Picchu the following day. There are also other versions of this trek that last 4 days and 3 nights (camping) and include the visit of other sites on the way. Finally, the Inca Jungle Trail will leave you with the most adrenaline rush. While this is the easiest option trekking wise, it combines different activities including downhill mountain biking, ziplining, rafting. The Inca Jungle Trail also includes transport in between some activities and nights in hostels. Machu Picchu is the obvious sight in the area. For most visitors, this is the sole purpose of coming to town. There are also several natural hot baths in the area, for which the town is named. The baths were destroyed by floods but have been rebuilt. You can find the baths by walking up the hill in town. They have the atmosphere of a public pool and they can get quite crowded, but they are still worthwhile for those who are tired from hiking. Putucusi, meaning "Happy Mountain" is on the same side of the river as the town. You can take a trail to the summit, which is about 2370 meters above sea level. The hike can be steep and quite intense, but the views are amazing and worth the effort. Do ask about trail conditions at the tourist office before you begin the hike. There is also a Butterfly House in the area that is worth visiting. You can sea butterflies in each of the four stages including egg, larva, pupa, and butterfly. Also of interest are the Machu Picchu Museum and Botanical Gardens, the Ecological Centre, and the Gardens of Mandor. Aguas Calientes is just 6 kilometers, or an hour and a half hike from Machu Picchu. The town has developed specifically for tourists, and as such, you'll find plenty of hotels and restaurants in the area. The town has a main square. Avenue Pachacutec is the only thoroughfare through town and it connects the main square to the baths. Next to the train station, where trains arrive from Cusco, there is a sheltered souvenir market. There is also a big market along the road to Machu Picchu. Aguas Calientas is a tourist town, and as such, prices are incredibly inflated. This is true for food as well. Confirm the price on your bill before you pay because scams are not uncommon. Ask the prices before you order and only pay what has been quoted to you. There are plenty of restaurants around town that cater specifically to tourists. Pizza restaurants are plentiful and usually decent. If you're looking for the best deal, head up the hill a little ways where you'll receive twice the food for half the price. There are several ways you can get to Machu Picchu. Most travelers leave from Cuzco and some choose to spend the night in Aguas Calientes, so they can arrive at the park early the next morning. This is recommended so you can avoid at least some of the crowd and you are likely to have better weather. To actually reach the site you can go by foot by the Inca Trail or you can take a bus from Aguas Calientes. There is a lot of waiting in line at Machu Picchu. You'll wait in line to get your bus tickets, you'll wait in line to get into the park, and then you'll wait in line again to see the major sites. Come prepared with all the patience you can muster. Even if you avoid peak season, you just can't avoid the lines.